Defining what actually constitutes a midsize watch, particularly with Rolex, can be a little tricky. To begin with, it is a fairly loose term anyway. Like with ‘men’s size’ and ‘women’s size’, there are no hard and fast rules as to what exact dimensions represent an intermediate. So, two different models in the catalog can have different measurements and still both be listed as the middle of the range. If you take the Rolex Datejust and the Yacht-Master as an example, a midsize Datejust is now officially either a 34mm (known simply as the Date) or a 36mm. For the Yacht-Master, the midsize is 37mm. But that’s not the only problem. As people’s tastes change, so do watch’s proportions. Just a few years ago, that 36mm Datejust was the biggest available, and had been since its debut all the way back in 1945. It wasn’t until the new 41mm was released in 2016 that the archetypal model, after more than seven decades, was usurped and became the in-between. With the Yacht-Master, it was the first of Rolex’s sports models to be issued in three sizes. The original 40mm was soon joined by an official ladies 29mm and a midsize 35mm. Today, neither of those two smaller pieces survive in the contemporary lineup, both replaced by the catchall 37mm. Nevertheless, at whatever measurements they come in, the midsize watch has become very important to Rolex. The brand has long cultivated an aura of exclusivity, but at the same time, their traditionally minimalist styling and timeless designs are intended to appeal to as many people as possible. Everybody wants a Rolex on their wrist, and Rolex wants every watch that leaves their production to be as perfect as possible. Getting the sizing exactly right is a fundamental consideration and has a huge effect on the overall look of the piece. Hence the various and changing dimensions across the range. That being said, there aren’t a whole lot of midsize pieces in the collection. Other than the above-mentioned pair, the only other watches to give the option are the Oyster Perpetual, the commonly regarded entry-level model, the Pearlmaster, which is basically a gemstone enhanced Datejust, and the flagship Day-Date—which has followed the same pattern as the Datejust by introducing a larger 40mm version very recently and relegating the time-honored 36mm to the middle. However, it is one of those elements of horology and watch collecting which seems to be in an almost constant state of flux. As the trend for hugely oversized pieces begins to lag, the demand for the more modest, understated examples continues to grow. That means, it could well be the one of the best times to start looking at some of Rolex’s middle-of-the-road offerings. Below, we will look at all of the considerations to take into account if you decide the midsize is the one for you. It is a strange anomaly with Rolex, and particularly with their professional range, that the precious metal watches or the ones dotted with diamonds, are often not as valuable on the pre-owned market as the most basic steel models. With names such as the Submariner, the Daytona or the GMT-Master, the most affordable vintage examples tend to be those in yellow gold, or at least the brand’s proprietary gold and steel half and half blend, Rolesor. So, while stainless steel is obviously a less expensive commodity to work with, the demand for them amongst consumers is enormous, pushing prices higher and higher. It is a phenomenon Rolex themselves have long fuelled, with their policy of ruthlessly limiting the number of new steel models they give out to their dealers to sell, increasing both desire and the lengths of waiting lists. The same cannot be said for any of the midsize range. Because they tend to be part of the Classic Watch collection (the Yacht-Master being the only exception) their supply has seldom been as restricted and price is largely determined on their makeup rather than reputation. Consequently, the steel examples are usually the cheapest. Prices for a vintage steel 36mm Datejust start at around the $3,000 mark. For that, you can pick up perhaps the most quintessential model Rolex has ever produced, with a seemingly endless variation of dial colors to choose from. You can also take your pick between the utilitarian three-link Oyster bracelet or the more intricate Jubilee, invented especially for the Datejust’s inauguration in 1945. However, the DJ also looks particularly good with a leather strap, and rates for those, although it will be an aftermarket addition, are often even less than our $3,000. Curiously, the smaller midsize 34mm Datejust, just called the Date, has a higher starting price than the 36mm. It boils down to simple supply and demand. The larger model has consistently been one of, if not the, biggest selling watches of all time. It is the model that most readily springs to mind when fans hear the name Rolex and has been produced in colossal numbers over a very long time. It is the sheer volume of 36mm Datejusts available over the 34mm Date that has affected the resale price. Even so, there is not a lot in it. Expect to pay a further $1,000 or so for the smaller version at the low end. As for the Day-Date, price of entry is generally higher for a couple of reasons. Firstly, the President has never been made in steel, or even in anything other than pure gold or platinum. All that precious metal bumps up costs. Secondly, the extra calendar complication, while fairly humble by modern standards, is still something of a work of art, and tends to increase the value. So, comparing like for like with the Datejust above, on a metal bracelet (the semi-circular three-link President bracelet which, again, was created especially for the watch) you will be looking at an outlay of around $8,000 or $9,000 for a fine example. On a leather strap, the price is likely to drop to around $6,000. For the Yacht-Master, there is a major discrepancy between the ‘new’ and ‘old’ midsize. The original, the 35mm released in 1994, is currently around half the pre-owned price of the 37mm which debuted in 2015. Both versions are also watches which have never been made purely from stainless steel. In fact, the closest they come is with another all-new innovation brought in specifically for the model, what Rolex call Rolesium. This mix of metals has a steel case and bracelet made from the brand’s insanely strong 904L steel, topped with a bezel of in-house forged platinum. All the same, Rolesium Yacht-Masters are still the least expensive to buy, platinum and all. For the smaller midsize, prices start at around $5,000 or $6,000. The much more recent, and bigger, 37mm kicks off at about $10,000. But easily the most attainable of the range is the Oyster Perpetual. With the contemporary series consisting of a total of five different sizes, from 26mm to 39mm, there are now two official midsize pieces; 34mm and 36mm. The OP has a longer production run than even the Datejust, and as the simplest, time-only model in the lineup, prices are extremely manageable. You will find some excellent examples coming in at around $2,000 for the 34mm version, about $3,000 for the 36mm. The 36mm examples of the Datejust and Day-Date have only officially become the midsize in very recent years, following generations as the largest in the range. Both have been immensely popular over the decades since their first release, and there are enough variations across each family to be almost literally too many to count. Of the two, it is the Datejust that has perhaps the broadest options list, mainly down to its more everyman persona. The 36mm model has never been made in platinum, but has been available in steel—the exact opposite of the Day-Date. (The 34mm Date, although it shares many of the other attributes and selections as its larger counterpart, is far more commonly only found in steel). While the Datejust may have been the top of the range offering on its launch, it was quickly superseded by the Day-Date, otherwise known as the President, a few years later. Since then, that model has been the chairman of the board, an unapologetically elitist creation, with only the fanciest getups. What both watches share is an enormous choice in dial color, bezel type, metal and bracelet combination. You will find red, white and yellow gold models of each, along with platinum Day-Dates and stainless steel Datejusts. You can take your pick from a selection of bezels; from the polished smooth type to the more ornate fluted kind, and even surrounds fitted with dozens of diamonds or other precious stones. One other style, which hasn’t been part of the modern-day lineup for some years and can only be found in the archives, is the distinctive engine-turned bezel. This describes the technique of cutting decorative grooves into the edging, and was once a popular addition which has since died out. But it is the dial of any watch that gives it the most identity, and the range of options available with both the Datejust and the Day-Date is simply staggering. Just about every color has been used during their respective production runs. Simple black and white faces are legion, as are the slightly more eye-catching silver and champagne. For those wanting to draw more attention, think of practically any color of the rainbow and chances are either watch has you covered. Strangely, given its reputation as the conservative old man of Rolex, it is the Day-Date that has been granted the most lurid dials of the two. During the 1970s, a short-lived run of so-called Stella models landed the President with incandescent faces in pink, orange, green and turquoise. While they failed to find much of an audience back then, the brand had another go in 2013, releasing a fresh crop of blindingly bright Presidents with dial names like Rhodium, cherry, chocolate and cognac, all with correspondingly colorful leather straps. Long story short, if you want either a Datejust or a Day-Date, you willfind one with a perfect arrangement of all their variables to match your personal sensibilities. The same can be said about the Oyster Perpetual line. Here too, you are spoilt for choice. It is a watch that errs more along the line of the Datejust with its metals, with no platinum option in sight, but plenty of gold throughout its history. The very earliest examples, and this is a watch that has stayed in the lineup for more than 80 years, were made from either 9k, 14k or 18k yellow or rose gold. White gold, along with platinum, has always been a no-show. Of the two officially listed midsizes, the 34mm and the 36mm, it is the larger of the pair which has traditionally been most sought after by a male audience, the smaller looking perfectly suited to an average sized female wrist. But both can claim almost as extensive a range as the more well known Datejust and President, with a similar selection of bezel types and dial colors. The one main difference is in bracelets. The Oyster Perpetual is virtually only ever found on a three-link Oyster band, while the DJ and Day-Date are more likely to be offered on any of Rolex’s metal trio. The Yacht-Master has a far more restrictive set of options, as does most of the professional watch collection compared to the more dressy end of the range. 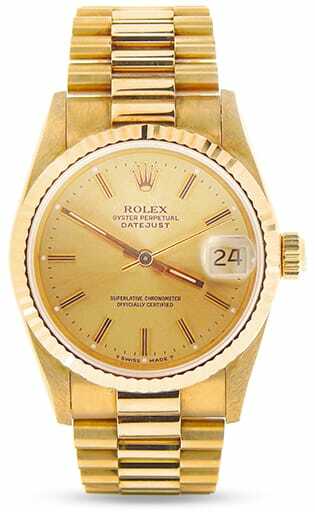 The older 35mm piece was originally only available as an all yellow gold watch, before the series was joined by Rolesor and the already mentioned Rolesium versions. The modern range, with its 37mm midsize, has done away with yellow gold entirely and replaced it with a beautiful steel and red gold model. But the biggest departure is the all Everose watch, topped with a black Cerachrom bezel and fitted with Rolex’s first ever rubber strap, the Oysterflex. It turns the Yacht-Master’s aesthetic on their head and is becoming one of the most popular versions in the range with both men and women. As we covered earlier, the exact dimensions that constitute a midsize Rolex differ depending on the watch itself. So, when the larger version of the Datejust was released, the classic 36mm model went from being the biggest in the range to the one in-between the 41mm and the ladies at 28mm. It was the same story with the Day-Date. When the 40mm arrived, the original immediately found itself officially retitled the midsize, even though there is no smaller model. Likewise with the Oyster Perpetual. The 39mm is a relatively new addition, so both the 36mm and the 34mm are now classed as the middle option. And the Yacht-Master has also had two midsize pieces, although they didn’t exist concurrently like the OP. The 35mm ran from 1994 to 2015, when it was replaced by the 37mm. It all points to the gradual increasing in watch sizes overall, something that Rolex resisted probably more than any other top manufacture. In truth, the whole of the brand’s range—men’s, women’s and midsize—are all generally smaller than their competitors. They are a brand that holds onto their traditions extremely jealously, and it takes a lot for fashion trends to have any influence on their output. It would be surprising for any of their core family to get any bigger than they are now. 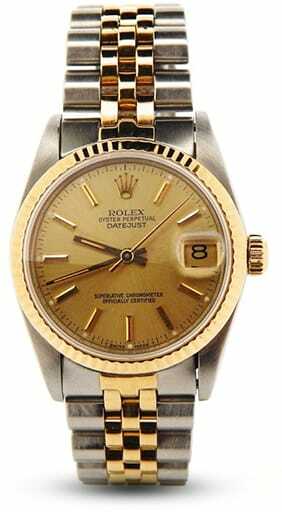 The watches Rolex offer in a midsize are among the most technically simple of the entire lineup. The relatively few models they make with added complications—such as the GMT-Master, Yacht-Master II, Daytona or the Sky-Dweller—are all only available in one size option. Most complex of all the midsize watches remains the Day-Date, the first model ever to display the date as well as the day of the week spelled out in full. It, like every longstanding Rolex, has been subject to myriad upgrades over its lifetime, all in the name of making it as near to faultless in terms of accuracy, convenience and sturdiness as possible. From the outset, the President benefitted from the engineering advances Rolex had made with the Datejust, released a decade before. That meant both watches adopted the same base caliber, and the Day-Date’s engine came fitted with the additional components needed for its second complication. So from the 1950s, each used movements from the Cal. 1000 series, Rolex’s first all in-house mechanisms. The Datejust housed the Cal. 1065, the Day-Date the Cal. 1055. COSC-certified, they beat at 18,000vph and introduced the Microstella regulating screws on the balance wheel. Both also incorporated the cam and jewel system which caused the day and date to click over instantaneously at midnight, rather than as a gradual process over several hours. That family of movements was replaced by the Cal. 1500s in the mid-60s, which increased the balance frequency to 19,800vph and eventually brought in a hacking feature. The modern era for both watches really started in the 70s with the unveiling of the Cal. 3000 range. (The Cal. 3055 for the Day-Date, the Cal. 3035 for the Datejust). Not only did it up the frequency again to the now-standard 28,800vph, it also debuted the Quickset function. Now, the date in the three o’clock window could be changed by simply turning the crown, rather than having to advance the hour hand through an entire day. The final big improvement came in the late 80s, when the President finally got a Double Quickset to alter both the date and the day of the week independently, with the Cal. 3155. Since then, the Day-Date has stuck with the same caliber, while the very latest 36mm Datejust has been given an upgrade to the Cal. 3235, with its industry-defining Chronergy escapement. The same sort of progressions mark the evolution of the Oyster Perpetual. Its series of movements have more or less mirrored the Datejust’s, except with time-only calibers. So, when the DJ graduated to the Cal. 1565, the OP got the Cal. 1560, etc. Today, both of the midsize OPs use the legendary Cal. 3130, a power plant built so well more than 30 years ago there has never been much point replacing it. As for the Yacht-Master, arriving in the early 90s, it hasn’t had as much time to go through as many variations as the others on the list. The original midsize model, the 35mm from 1994, was driven by the Cal. 2235, the third generation of calibers Rolex built exclusively for their ladies range. The 37mm released in 2015 used the follow-up Cal. 2236, the first time the brand had included silicon technology into one of their movements, with the Syloxi hairspring. Interestingly, both calibers have, at one time, held the record for the most consistently accurate timekeepers ever examined by the Official Swiss Chronometer Testing Institute. One aspect all Rolex’s midsize models share is a water resistance of 100m, provided by the world-renowned Oyster case. It means none of them qualify as a dive watch, but remain more than impervious enough to thrive in just about any other situation. The models Rolex have decided to make in a midsize are amongst the most popular and well-known of the non-professional range. As such, they have always been built in huge numbers, with no real effort by the brand to artificially limit the supply to increase demand. The Datejust, Day-Date and Oyster Perpetual are absolute emblems, universal pieces that have barely altered over a long and successful life. Therefore, prices for these models have stayed at the realistic end of the spectrum, with none of the grail watch shenanigans that have raised the rates of some of the early sports pieces into the stratosphere. Even the very first examples can be had for surprisingly small amounts. 80 year-old Bubbleback Oyster Perpetuals, watches that arguably made Rolex what it is today, can be bought for between $2,000 and $3,000. That is an awful lot of history for not much money. Similarly with the Datejust. The original reference, the ref. 4467, is available for a low five-figure sum, while the ref. 6511 which marked the debut of the Day-Date is about the same. The truly collectible examples, the ones you can be pretty sure are going to increase dramatically in value, are fairly few and far between. One possibility for the Datejust is the perpetually underappreciated Turn-O-Graph. The first serially-produced watch to feature a rotating bezel, it became known as the Thunderbird in the American market after it was implemented as the official timepiece of the USAF Air Demonstration Squadron. Prices for these particularly rare specimens are currently on a par with standard DJs of the same era, but make an intriguing target for speculators. With the Day-Date, the so-called Arabic dials released as special editions for the Middle East market always attract plenty of attention. Dating as far back as the early 50s, these limited runs with both the day and the date depicted in Arabic script have usually been forged in platinum, with the Islamic religion forbidding men from wearing gold. The precious metal coupled with the scarcity of examples for sale make these models highly sought after. As the relative newcomer, the Yacht-Master has even fewer ultra rare models for collectors to fight over. However, with the discontinuation of the original 35mm midsize, that watch has suddenly been given a natural desirability. With no more being made, those that remain on the pre-owned market are likely to become more valuable. In addition, the contemporary crop is without any all-yellow gold references for the moment, so one of the early 35mm pieces in that color could well be an attractive proposition. For just about the whole of the 20thcentury, the pieces that we today identify as midsize Rolex actually represented the largest models in their respective series. So the 36mm Datejust released in 1945 and the similarly sized Day-Date, launched in 1956, were very much listed as men’s watches, whereas today both have been displaced by bigger siblings. The same is true for the even longer-established Oyster Perpetual. Until the 39mm example from a few years ago, the 36mm was the top end, with a 34mm the next step down. Now, both of those models are the middle option. It was only really a matter of time before it happened, and Rolex were one of the last manufactures still holding out against the trend for ever larger watches. Even during their first golden age in the 1950s, when the brand unveiled a seemingly endless stream of iconic tool models and housed them all in 40mm cases, the stalwart dress offerings stubbornly refused to grow beyond their original dimensions. It has left a pre-owned market awash with a sea of timepieces of some utter classics at unexpectedly low prices. The watches themselves have been altered far more inside than outside over the several generations they have been with us. In the true Rolex spirit, the aesthetics were more or less perfected before any of them saw the light of day, and the only thing remaining was to fine-tune the efficiency and accuracy in their performance. So, a Datejust from the 1960s for instance, is almost indistinguishable from a brand new example until you turn over the price tag. Updated calibers in the 70s and 80s brought with them extra levels of expediency, with the introduction of hacking seconds and single then double Quickset functions. The 90s saw a first from the brand with the introduction of a sports watch in three different sizes. The Yacht-Master initially emerged as a full-size 40mm, and the popularity of that model (basically a more luxurious Submariner) led to a 35mm and a ladies 29mm. When the midsize was adjudged a little on the small side it was granted a couple of extra millimeters in 2015, while the women’s watch was dropped altogether. The contemporary lineup of midsize Rolex then consists of the 36mm Datejust and Day-Date, another 34mm Datejust variant just called the Date, (as well as the Pearlmaster in the same size) alongside the 37mm Yacht-Master and the 36mm and 34mm Oyster Perpetuals. It is not a huge selection overall, but it is proving extremely popular. These days, a 36mm watch looks nicely understated on the average male wrist, and recent fashion trends means they also look perfectly suitable on women. This unisex appeal has brought Rolex an even wider audience than they already had, and they remain the most successful watchmakers in the business by an indisputable distance. Notorious for a completely unwavering dedication to quality, any Rolex is a design and engineering triumph, whatever its dimensions. By offering their best in scaled-down sizes, the brand has ensured just about anyone can wear one of their masterpieces.